We very much appreciate you volunteering your time to MHTP and your energy to this technological endeavor. Thank you. There quite a number of TwTMs on Facebook already. This page is a very long description of what to do your first time(s). Listen to past TwTM videos to get a feel for the end result. Try to go live around 8 pm local time on your Thursday. If you need to go a little earlier or a little later, that is fine. If you have an emergency, or need technical assistance at any time, scroll to the bottom of this page for how to get help. A day or so before your Thursday, you will be given access to the MHTP Facebook page. This allows you to post from the MHTP Page. TwTM must be broadcast from the MHTP Page, NOT from your personal Facebook page. You are welcome to practice doing Facebook Live from your own Page at any time. It is possible to test this without anyone else being able to view it. Instructions for this are in an appropriately titled section below. If you have never done Facebook Live before, in all honesty, it will probably take you at least an hour to get everything set up the first time. The great thing is that once you’ve done it, it will never take that long again. A few people who have done this for MHTP have also gotten requests from friends and family to play more often for them via their own page. You might find yourself bringing more live music to your loved ones after you get used to it. You can use this exact script for introducing yourself and closing. You are welcome to modify that script to sound more like yourself, but you need to remain within MHTP’s scope. Remember that you are representing MHTP from the MHTP Page. If you are unsure, then just stick to the script. Listen to what others have done for TwTM to see what works. This is your chance to showcase some of your favorite and/or most effective therapeutic tunes. You will transition from song to song as you would in a normal session. As in a normal session, it is okay to use silence appropriately. If you are using notation, make sure you have room for your sheet music as well as the device that you’re broadcasting from. When setting up the space to broadcast from, be mindful of what will be in the range of your camera. Take a look at what other people have used for backgrounds for TwTM, and determine what you feel comfortable with people seeing of your living or workspace. Notice the different backgrounds. What do you want your audience to see behind you? Aim the camera away from light fixtures. A bright light shining behind you will make you very dark. Shine the light on yourself instead. Make sure you can’t hear the television, other people, barking dogs, or phones ringing during your playing time. This isn’t a performance, so you don’t have to be perfect. But the less visible and auditory background noise, the better. Give yourself some time to get used to the controls for Facebook Live, and take a look at how your setup broadcasts. Is your body too dark? Is your instrument outside of the camera? Testing allows you to make adjustments ahead of time. Post from your own Page, not MHTP. Change the settings on the post to Only Me. …and then you’ll see the option to pick Only Me. …and then you will see the option to post to Only me. Changing who can see your post isn’t available from the MHTP Page, so you won’t be able to practice once you’re on MHTP. Once you’ve changed the settings to Only Me, you can follow the rest of the instructions in the sections below (either to broadcast from your phone or your laptop). You will only “go live” for your own self; none of your Friends or anyone will be notified that you are live. When you’re done, you can choose to “post” the video so that you can see how you did. Again, that “post” will be seen by Only Me. No one else looking at your timeline will be able to see it. When you’re ready to do TwTM for real, remember to switch over to MHTP’s Facebook. The sections below go into detail about the steps for doing Facebook Live from MHTP’s Page. When you’re done testing on your own Page, be aware that these settings might “stick” for your next posts. 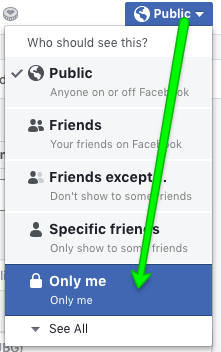 When you are ready to do a real post from your own Page again, check that the settings are on Friends or Public or however they started. Otherwise, your Page might keep creating Only Me posts. If you feel comfortable, let your Facebook Friends know ahead of time when you are going to go live. You might have family members, close buddies, acquaintances, or business contacts who are curious about what you do as a CMP. This is a terrific chance for them to see and appreciate your skills. Go ahead and post on your own Page what time you’ll be broadcasting, and direct folks to Like the MHTP Page ahead of time. Afterwards, you can also Share the posted Video of your TwTM onto your own Page for others to view later. Obviously, this helps spread the word about MHTP, so I don’t want to be disingenuous about that aspect of it. But it truly is a very nice way to show off what you do and demonstrate the very valuable service you provide. This section shows screenshots from an iPhone. If you are using another type of phone, the process should be the same, but the images will be a little different. To broadcast from your laptop, scroll down to the next section. You can only broadcast using the app, not through a phone browser. Go to the app store to download the Facebook app for free. A fully charged, properly functioning phone should be able to make it through TwTM on battery power. If you have doubts, then plug it in. You must begin this process on MHTP’s Page, NOT your own page. Use the search bar at the top of the app to find it. Search for the Music for Healing and Transition Program in the app. As a Page editor, you have to scroll quite a ways to get to the area of the page that allows you to post. Watch for it; the area is quite short until you click into it. …until you’ve scrolled enough that you see this small, short area enticing you to create a post. Touch where it says “Create a post”, and the area will expand. Once you click Live Video, you will have a chance to do final edits and other additions before you are actually live. After clicking Live Video, you start to see a preview of the image that you will be broadcasting. For the next couple steps, it is easiest to continue in portrait orientation, holding the phone in your hand. Once you’re ready to go live, we recommend using landscape orientation. Click the small button next to Start Live Video to add a donate button for MHTP. If you want, you can share a general area that you are broadcasting from, such as your neighborhood, city, or state. Touch into the text of your post to see the location icon. Touch the location icon, and you’ll see suggestions for areas near you. You can type to search for a different location. Skip this step if you do not want to share any location information. …and choose a location that you are comfortable with. You can be as vague as just selecting your state. Remember, your location is completely optional. Just skip this step if you are not comfortable sharing it. Now that you’re done adjusting the post, position the phone how you would like the camera to be. We recommend that you broadcast in landscape. Check your hair, check your teeth, and press Start Live Video. Everything in place? Click Start Live Video. Don’t worry: you’ll have 3 seconds to move your hand out of the way. You will get a 3, 2, 1 countdown, and then you’ll be live. Relax. Read your introduction, play your example session, read your closure. Press the Finish button firmly to end the live broadcast. When you’re done with your live broadcast, you’ll be asked if you want to keep it. YES! Make sure you post it. Click to Post your video so that it can be saved. DO NOT DELETE. The Post part is an important step. Please don’t just walk away after clicking to end the video. Make sure that you press Post to complete the post. Otherwise, the video will go away. Need help? Scroll to the bottom of this page for tech support. We appreciate the time you put into this. Your example session helps students and potential employers understand what CMPs do. As a non-profit, MHTP reports the hours that volunteers provide. Please log your volunteer time here. Thank you. At time of writing, Facebook only allows you to do Facebook Live from the Google Chrome browser. You must download the latest version of Google Chrome in order to broadcast from your laptop computer. If you aren’t sure if your laptop can make it through 20+ minutes of video recording, then plug in. Once you are on MHTP’s page, you need to select to post as MHTP. The default will probably show your own Profile image in the circle. If you keep yourself as the poster, you will not be able to find the option to do Facebook Live. There is no option for Facebook Live if you try to create a post as yourself. Click the upside-down triangle, and select to post as the Music for Healing and Transition Program. Do NOT write anything yet. The first thing you need to do is click the option for Live. The Live option appears after you have switched to post as MHTP. If you don’t see the option for Live, then you’re not posting as MHTP. See the images above to switch from yourself to be MHTP. Don’t worry: clicking Live doesn’t immediately make you go live. You will have plenty of time to preview before you are actually live. After you click Live, you might be asked to allow Facebook to use your laptop camera. Click Allow. Click Allow to let Facebook use your camera and mic. If this doesn’t work, remember that you must download the latest version of Google Chrome in order to broadcast from your laptop computer. Paste the description from the script into the description area. 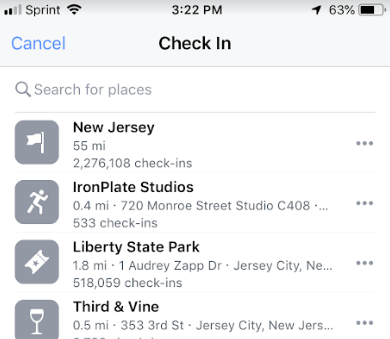 Optionally, click the location icon, and search for a location you feel comfortable sharing. You can pick something as generic as your state or as specific as your neighborhood. If you do not want to share this, just skip this step. Click the coin with a heart in it to support a cause, start typing “Music for Healing”, and select the MHTP page. Check your hair, check your teeth, and press Go Live. You will get a 3, 2, 1 countdown, and then you’ll be live. Click the red button. You might be asked to confirm that you really meant to end it. Click the red button when you’re done. Confirm that you meant to end it. Once you are done being live. Facebook asks if you would like for the post to remain, or if you want to delete it. DO NOT DELETE. Select the option to post your video. That will make it available for all time. Otherwise, it will not be able to be shared or viewed later. The wording will be a little different, but make sure you click the button that finishes the post. DO NOT CLICK DELETE. This is an important step. Please don’t just walk away after clicking to end the video. Make sure that you click Done or Post or whatever button that it asks you to click to complete the post (wording might be slightly different from this screenshot). Otherwise, the video will go away. If you need tech support, please contact Karen Peterson at any time via text at 201-344-7728.